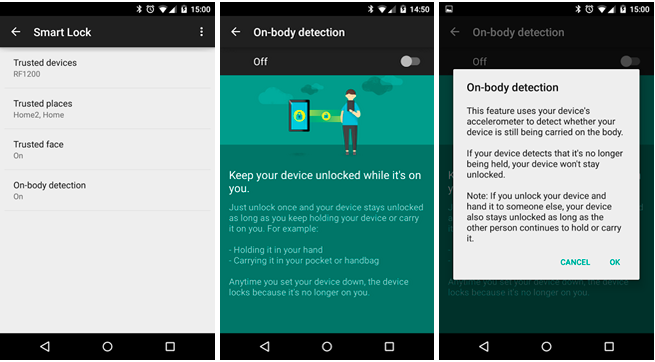 Google seems to be rolling out a new ‘Smart Lock’ feature for Android devices running Lollipop — On-body detection. This new feature will only lock your device when it is sitting on a table or in your pocket. The feature will make use of the accelerometer on your Android device to detect any movement. In case it does not detect any movement, it will automatically lock your device. But if you are holding the device in your hand and it is already unlocked, On-body will keep it unlocked. In case you hand over your device to someone while it is unlocked, On-body will keep it unlocked. The feature cannot determine who is holding the device, it only knows that someone is holding it and thus keeps it unlocked. Google is rolling out the feature only to selected users for now, but it is likely that a wider rollout will start within the next few weeks. For now, the feature has only shown up on Nexus devices, but it is likely that Google will roll it out to other Android devices running Lollipop as well.